The A79 from Ayr to Prestwick. The road is bisected here by Prestwick Airport. It continued to Monkton on the other side of the airport. From Ayr to Monkton it shared the line with Turnpike 1 (Ayr to Irvine). From Monkton it continues on a minor road towards Kilmarnock, then the A77(T), and the B7038 into Kilmarnock. 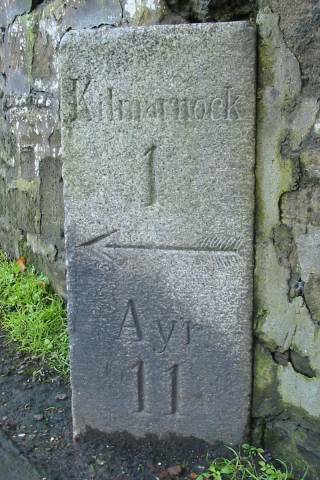 1767: The road from Ayr to Kilmarnock. 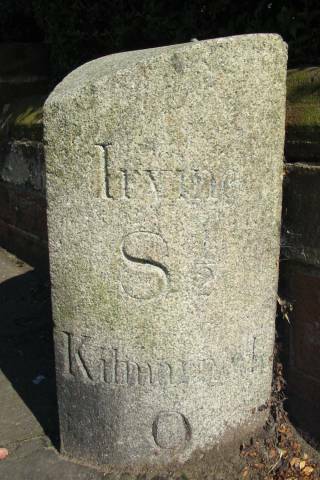 1827: The road from Ayr to Kilmarnock, passing through the parishes of Newton, Saint Evox, Monkton, Symington, Craigie, Dundonald, Riccarton, and Kilmarnock. Ayr 2, 3, 5, 10, 11. 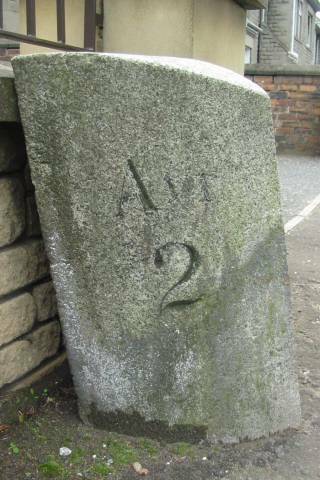 Ayr 2 and 3 are common to Turnpikes 1 and 2. 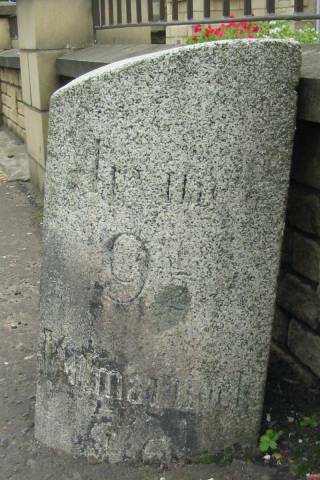 There is also one stone in the collection on the Montgreenan Estate which came from this road, and which is described and illustrated in its proper sequence below. On E side of road. Photos DMcC 27th August 2004. On SE side pf dual carriageway between Brocket Farm and the roundabout. Photos DMcC 18th March 2009. 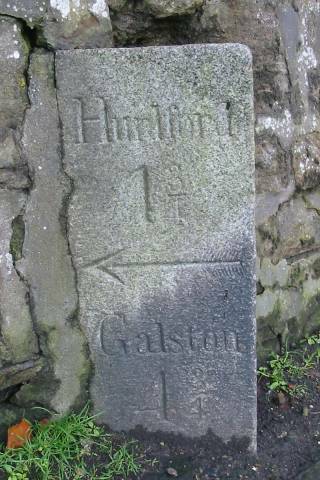 This direction stone is no longer on the road, but in the collection described in 'The Montgreenan Milestones' (Ayrshire Notes 46). The original location was at the junction of T2 (the road from Ayr to Kilmarnock) and T24 (the road leading from Irvine, by Stair Bridge, to Dalmellington); in modern terms this is on the B730 at the junction with the A77, prior to the construction of a flyover. 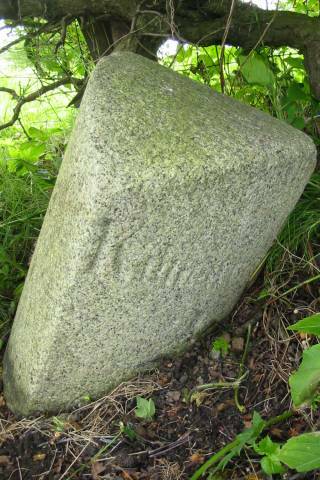 According to the 1 st OS there was a ‘guidepost' at this junction, and this stone is a guide or direction stone with no distances. Bogend turnpike or toll was also located at this junction, which is still known as Bogend Toll. 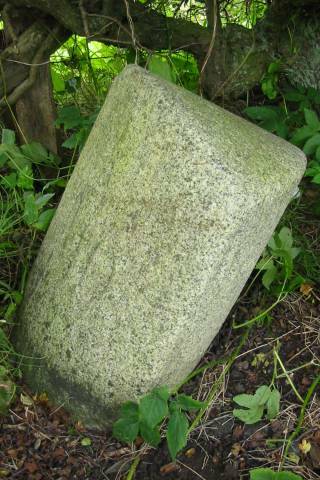 Height (by long inclined side) 51cm. Hidden in a hawthorn hedge opposite MGM Garden & Leisure. Photos DMcC 28th August 2004. On E side of turnpike 2 and S side of turnpike 14. 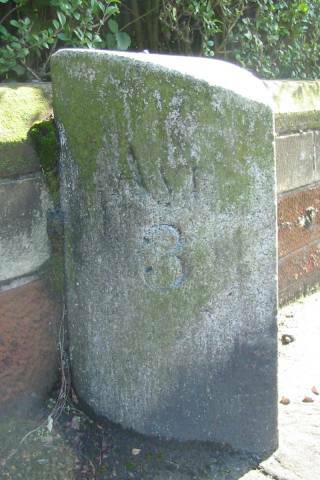 This square section stone is set into the wall of the graveyard of Riccarton Parish Church, at the junction of Old Street and New Street, with two adjacent faces visible. There must be an arrow for Ayr below ground level. Photos DMcC 26th October 2004.